Kansas City, Mo. 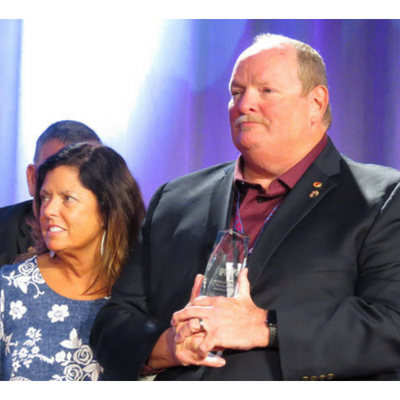 - The Flexographic Technical Association (FTA) named Tension Corporation's Lon Robinson as their 2018 FTA Hall of Fame inductee. FTA established the Hall of Fame in 1962 as a way to annually recognize an outstanding individual who contributes both to the FTA and the flexographic print industry. Lon is the 56th member to be inducted. Robinson has been extensively involved with the FTA serving on the FTA Board of Directors and Foundation of FTA (FFTA) Board of Trustees. He has served as FFTA Vice chair and FTA Board chair, judged entries in the FTA Technical Innovation Awards and the Excellence in Flexography Awards, and served on the FTA Awards Committee. "It is a tremendous honor for me to be inducted into the FTA Hall of Fame. The current members are a group of people that I have looked up to for years. They are my "'go-to' people" when I have questions on printing issues," said Robinson. A life-long dedication to learning has helped Robinson advance in both his career and industry involvements. Since joining Tension Corporation in 1979 as an entry-level pressman, he's grown through five promotions to his current position as Director of Research and Development. Industry-wise, he received the FTA President's Award in 2012 and the FTA Distinguished Service Award in 2015. He's also an active leader with the Envelope Manufacturers Association (EMA), as chairman of the EMA Postal Affairs Committee and one of the EMA representatives to the USPS Postmaster General's Mailer's Technical Advisory Committee (MTAC). In 2012, Robinson received the EMA's Daniel H. Lipman Member-of-the-Year Award. "There is no other Lon Robinson in this industry," said Tension Corporation General Manager Jim Brown. "His level of knowledge for anything print, customer inserting equipment, engineering or envelope machines is simply phenomenal, and it's something he so willingly shares among colleagues in our industry, company and customers. He is truly something special."